FRESNO, Calif. (KFSN) -- Good news from the Fresno Chaffee Zoo! 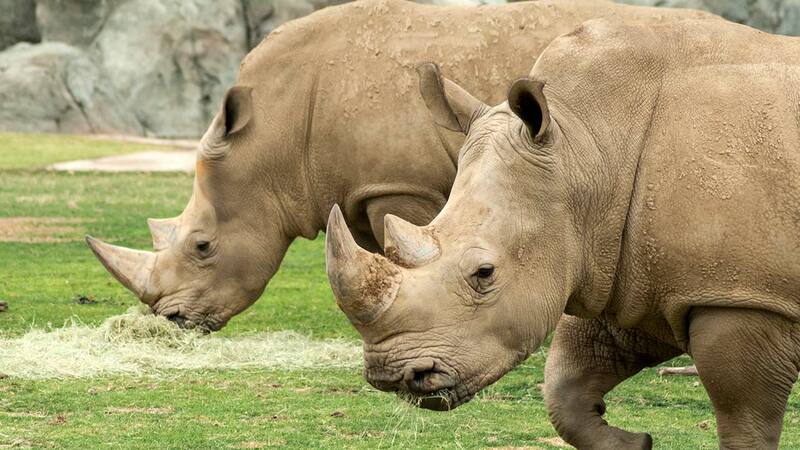 Their Southern white rhinos, Tim and Kayla, are expecting their second calf together! "We are expecting the calf to arrive between January and April 2019," said Vernon Presley, curator at Fresno Chaffee Zoo. "Rhinoceros gestation is 16 months and we have to estimate the due date based on Kayla's physical changes and hormonal analysis." Officials said this will be the second rhino calf born at the zoo. The first calf was named Rudo and was born in January of 2017. While Zoo staff are anxiously awaiting the arrival of this calf, it is a bittersweet time. "Since Kayla is expecting, we are making arrangements to find another home for Rudo," Presley said. "The goal is to secure a new home for him in the fall of 2018. Kayla is a great mom and we expect her to be very protective of this calf, just like she was with Rudo. Additionally, Rudo is getting more mature and eventually he and Tim will no longer get along. So, while we will miss him dearly, we are happy to be able to secure a new home for him in the near future." Both Tim and Kayla moved to Fresno in 2015 for the grand opening of African Adventure. Kayla was born in 2005 at Disney's Animal Kingdom while Tim was born in 1996 at San Antonio Zoological Gardens and Aquarium but came to Fresno from Lion Country Safari in Florida.